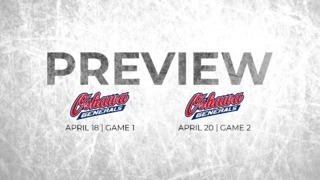 Tye Felhaber scored the winner and Jack Quinn scored his first OHL goal as the Ottawa 67’s downed the Hamilton Bulldogs 4-3 in overtime on Sunday afternoon. The win caps off a winning weekend road trip for the Barber Poles, who went 2-1 over three days and have now won two in a row. Felhaber scored a pair of goals in the win, while Lucas Peric and Quinn rounded out the scoring. This was a back-and-forth game from the start. Quinn opened the scoring with 1:45 remaining in the opening 20, a period where Ottawa outshot Hamilton 14-8. Brandon Saiegon tied the game for the Bulldogs a minute into the second, with Arthur Kaliyev giving his team the lead a few minutes later. Peric and Felhaber combined their efforts with a goal each in just about two minutes to allow the Barber Poles to go to the locker room with a 3-2 lead after 40 minutes played. 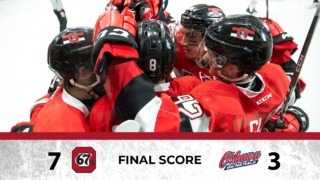 Nicolas Mattinen scored the lone goal in the third period, pulling Hamilton even and sending the game to overtime. 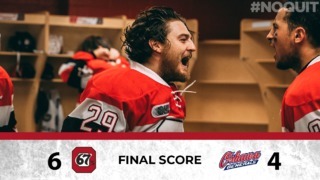 It didn’t take long for Felhaber to win it for the 67’s in the extra frame, as he charged into the offensive zone and scored the deciding goal just nine seconds into OT. The Barber Poles will be back in action on Wednesday, October 3rd as they visit the North Bay Battalion before returning home for a pair of games next weekend.